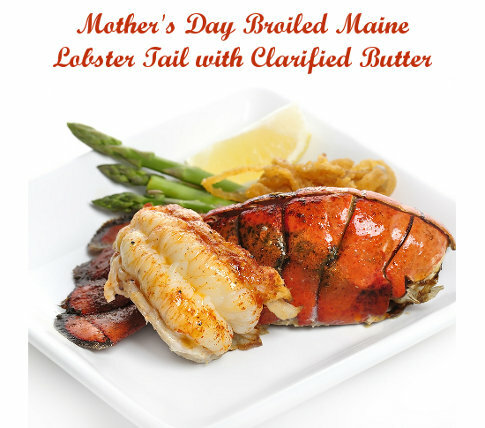 Broiled fresh Maine lobster tails with clarified butter for Mother’s Day is an affordable and easy meal to prepare and can go a long way toward making this Mother’s Day celebration a really special occasion. And the good news is that even if you have never tried before, broiled Maine lobster tails are so easy to prepare at home it is almost impossible to mess up. When broiling lobster tails for the first time, please note size does matter … a smaller tail (4 oz.) can be the way to go. Larger tails take longer to cook and care must be taken not to overcook or the large tail can become tough. Broiling smaller tails is much more forgiving. Smaller tails are also a bargain and can usually be bought and delivered for less than $10 a tail. Compare to the cost of a whole lobster at $20 to $30 or more. The concept behind the broiled lobster tail with clarified butter is that the lobster can be the star of the meal or it be combined with a filet or other steak to make a surf and turf dinner. The choice is up to the chef. The Clarified lemon butter is the key to making this lobster-tail dish absolutely delicious. It’s well worth the additional work so don’t cut any preparation corners here. 1. Cut the top of each shell all the way down the center with kitchen shears. Stop cutting just before the fan tail. Insert fingers gently into the shell incision to loosen the meat. Gently pull the meat and fan it on top of the shell. Set tails aside. 2. Cut and squeeze lemon juice into a bowl. 3. Place butter into a medium sauce pan. Heat over medium-high heat until the butter begins to turn white and foam. The milk solids will begin floating to the top. With medium sized spoon, skim off the milk solids and discard. Repeat the skimming until there are no more milk solids. Stir in lemon juice and add ground black pepper. Lower the heat to keep butter mixture warm. 4. Baste the lobster tails with the warm, clarified lemon-butter mixture. Place the remaining butter in ramekins. 5. Preheat broiler oven. If using a temperature gauge, broiler should be pre-heated to about 425 degrees. 4. Place lobster tails on broiler pan and adjust pan so the tails are about 6-9 inches away from the broiler flame. Broil for 3-4 minutes (longer if using larger tails). Keep a close watch and take care not to overcook. The lobster tails are done when the shell turns bright red and the meat has turned an opaque white. 5. Serve immediately with a ramekin of clarified lemon butter. When most people think of Las Vegas, they tend to think of the famous American city’s casinos and its nightlife. However, if you were to take a trip to Vegas, you would quickly discover that there are many other things to do in Las Vegas than playing at one of its many unique and massive casinos. 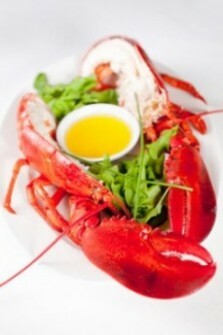 For instance, it is home to several fantastic lobster and seafood restaurants. On a side note, to learn more about Las Vegas and other exciting casino information check out VegasMaster.com, an online portal that specializes in providing extensive info about online casinos and online gambling. American Fish by Michael Mina – located in the Aria Hotel Casino, this upscale restaurant offers patrons a fine dining experience in a beautiful ocean-themed atmosphere. Some of the exquisite foods you will find here include New England Lobster Roll, Mustard-Marinated Black Cod, and Cornmeal-Crusted Rainbow Trout. Aquaknox – at the famous Venetian Casino and hotel, you will find Aquaknox, an incredibly sophisticated seafood restaurant that provides customers with a menu that includes fresh fish that is flown in each day and skillfully prepared to create succulent dishes like Maine Lobster Bisque. Other tasty dishes include Yellowfin Tuna, Stone Crab Claws, Alaskan Halibut, and Caviar. Mastro’s Ocean Club – the Las Vegas version of this seafood restaurant can be found in the posh shopping mall located in the CityCenter Complex. The restaurant is situated within a curvy two-story structure that is known as “The Treehouse”. Some of its signature dishes include the Butter Cake and the iced Seafood Tower. Patrons looking for traditional seafood dishes will also find Alaskan King Crab, Broiled Live Main Lobster, Salmon, Halibut, and Tuna.